Karl Joseph Kuwasseg (1802-1877) was born in Trieste and went to Vienna where he produced some watercolours. He accompanied the Count of Schomburg in his travels in Europe and America, from which he brought back several landscapes. He settled in Paris in 1830 and was naturalised as a French citizen in 1870. His son, Charles-Euphrasie (1838-1904) was also a painter. 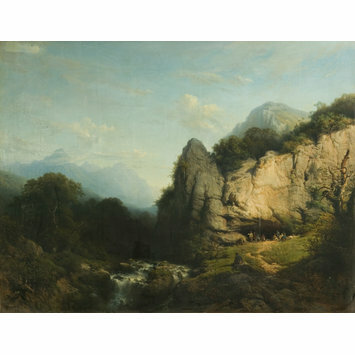 This painting is a fine example of the landscapes produced in Germanic Europe during the 19th century. The representation of a grandiose nature is characteristic of the Romantic aesthetic emerged in the 1830s under the leadership of Caspar David Friedrich. 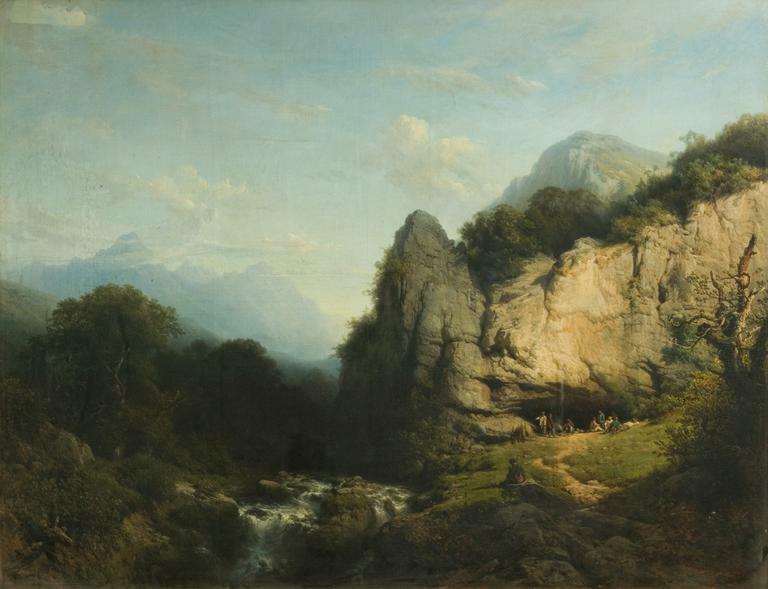 This view of the Tyrol is typically executed with a high degree of finish and clear tones. A mountainous landscape with a torrent flowing on the left, a cliff in the sunlight on the right, scattered with trees and bushes; mountains vanishing in the mist in the background. Historical significance: This type of paintings with a particular focus on Romanticism, the Sublime, and a high degree of idealization, was particularly praised in Germanic Europe. Kuwasseg executed several landscapes dominated by dramatic atmospheric conditions such as Fisherfolk on a Shore aty Sunrise, Private collection and A mountain torrent, sold Christie's London, 1 Oct 2008, lot 64. His style does not seem to have changed throughout his career. Such pictures were particularly popular with collectors and patrons during the 19th-century. The word Romanticism derived from the medieval term 'romance' and was first used by the German poets and critics August Wilhelm and Friedrich Schlegel to label a wider cultural movement beginning with the late 18th and ending towards the mid 19th century. Romanticism started first in Western Europe as a literary and philosophical movement and only gradually involved the other arts, explicitly around 1800. Romantic artists were fascinated by nature they interpreted as a mirror of the mind. They investigated human nature and personality, the folk culture, the national and ethnic origins, the medieval era, the exotic, the remote, the mysterious and the occult. The interest in the exotic and the non-Western, illustrated in France by such a painter as Eugène Delacroix (1798-1863), as well as the medieval revival, witnessed in England by Horace Walpole (1717-1797), are perhaps the most identifiable parts of Romanticism. It is really in the Post-Napoleonic period that this movement gained ascendancy. Its greatest proponents were among others Théodore Géricault (1791-1824) and François-René de Chateaubriant (1768-1848) in France, Joseph Mallord William Turner (1775-1851) in England, Heinrich Heine (1797-1856) and Caspar David Friedrich (1774-1840) in Germany. In the visual arts, it was largely played out by 1850, but in music it persists for another generation. Kauffmann, C.M. Catalogue of Foreign Paintings, II. 1800-1900 , London: Victoria and Albert Museum, 1973, p. 59, cat. no. 129.